William J. Ryan Sr. was born in Lockport on December 21, 1894. 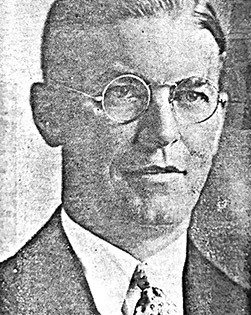 He had worked for Niagara Textile Co. from 1911 to 1953, holding several supervisory positions. Ryan had been a production superintendent, director of purchasing, personnel and labor relations and was elected to the board of directors in 1943 and was vice president in 1946. He resigned from the firm in 1953 and began working as a field representative for Blue Cross of Western New York in Niagara, Orleans and Genesee counties. Ryan retired as an account executive in 1971. He joined Division 4 AOH in 1911, was president of Division 4 for two years, county president another year, state president for 10 years and national treasurer for four years starting in 1935. The Division was named in his honor on September 8, 1979 and he received the Division 1 Buffalo Award and U.S. Congressional Award in 1981. Ryan also was active in the Knights of Columbus 319, serving as Grand Knight in 1941, president in 1943, district deputy in 1955, and was given honorary life membership in 1966. He was a member of the Fraternal Order of Eagles from 1934 to 1985, former president of St. Patrick's Holy Name Society, former president of the Lockport Foremen's Association, chapter member of Lockport Industrial Management Club for 35 years and was an active Hibernian. Ryan was the city health commissioner from 1934-1939 and was sector chief of the county Civil Defense from 1951 to 1953.